Touchdown Football was an early football game for the Atari 7800. It’s actually a port of an 8-bit computer game of the same name by Electronic Arts. This was well before Madden Football became a thing. 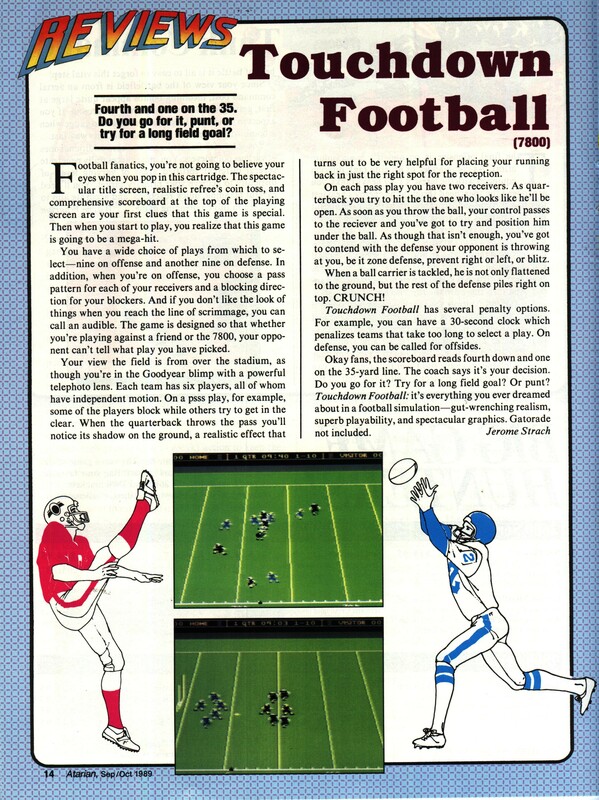 The original computer versions were released in 1984 and it was a decent football game for its time. The Atari 7800 version did not do much to improve upon the original and it was starting to look dated when it was released four years later in 1988. It’s not that the graphics were terrible but animation and speed were somewhat lacking and control wasn’t great either. By this time there were much better football games available. The reviewer above was definitely looking at this game through rose colored glasses…or just trying to sell it. By the time this game came out on the 7800, there were much better options on other platforms. Sadly, this was the story of the Atari 7800, largely because of the very low budget given to game development. The bad news is that this game hasn’t been re-released so there’s no way to play it other than to find an original 7800 cartridge or one of the earlier versions e.g. for the Atari 8-bit or Commodore 64. The good news is that original versions should be pretty cheap. The above review is from the September/October 1989 issue of Atarian magazine. The hardware of the Atari 7800 was not inferior to the NES (in some ways it was better), but Atari’s decision to first delay its release and then to concentrate on yet another iteration of its various arcade classics instead of emphasizing new games doomed it. 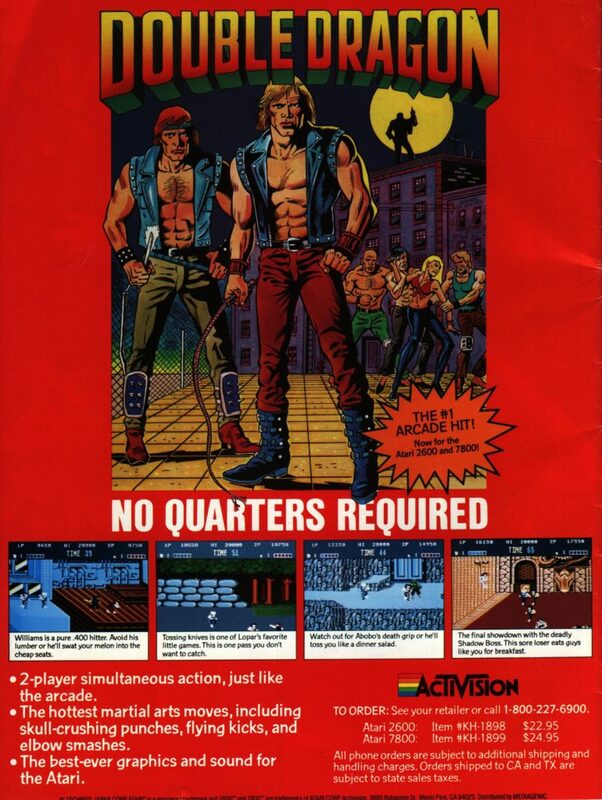 Double Dragon is one of a relative few new style games that appeared on the system and it was done by Activision. Atari 7800Double Dragon is also interesting because it appeared on both the NES and Atari 7800 (as well as the Sega Master System and various home computers). In comparing the two, there is not really a clear winner. The graphics on the NES version are, on average, somewhat better. However, the Atari 7800 version is a more faithful port of the arcade original and it allows two-player cooperative play unlike the NES version. While not the best Atari 7800 game, it does enough to prove that the 7800 was capable. There were a few games that demonstrate Atari 7800s technical capabilities better but only a few. Those that developed Atari 7800 games, particularly Atari themselves, often did so as cheaply as possible, making decisions that hurt game quality like limiting cartridge memory. Atari 7800Oddly, Activision also decided to release an Atari 2600 version of the game. This was in 1989. Though to be fair, the Atari 2600, in one form or another was sold until 1992. In addition, the Atari 7800 was backwards compatible. The Atari 2600 version of Double Dragon is surprisingly good given the limitations of that system and is interesting from a historical perspective but it can’t compare to the other versions of the game. Atari 2600If you’ve played Double Dragon on the NES or even SMS, it is still worthwhile to give the 7800 version a try. It is the most faithful to the arcade original and gives you two player cooperative play. Overall, the NES version is probably the better game but it isn’t as clear-cut as some may think. While a few Atari 7800 games have been re-released by way of the various Flashback consoles, Double Dragon is not one of them. To play this version (or the Atari 2600 version) you will have to track down an original or resort to emulation. The ad above is from the September/October 1989 issue of Atarian.